Welcome to the official Imperial news bulletin for Anacreon Era 3, created at the suggestion of Wayward Device. Greetings in the name of the Imperium! Our capital world, Terra (or in the most ancient of historical records: Earth), resides within the great northern nebula. The Grand Praetorian Fleet maintains an everlasting vigil over the Imperial throne and ensures that no hostile force will ever capture our ancestral homeworld or its Eternal City, New Rome. It is from here that I, Terran Imperator Aeternal, seek to bring the light of civilization to the rest of the galaxy. Our citizens live in the lap of luxury. By ensuring that every single world achieves post-industrial technology, we have all but eliminated poverty, sickness, disease and death throughout the Imperium to create a utopia only dreamed of by lesser sentients. Efficiency peaks with robotic facilities and fully automated shipyards, despite the significantly reduced population numbers required to operate such advanced machinery. We seek only to spread our knowledge and technological advancement to all other sovereign nations. Unfortunately, not all are so open to receiving our gifts. Many legions were lost in the Great War with Mercutio, although thanks to the valiant efforts of many neighbouring powers who were also threatened by the marauding menace, we managed to eradicate their fleets and uplift their broken worlds. Then our legionaries returned home... but not to parades and celebrations on Terra, but rather wanton death and destruction sowed throughout the Imperium by the rogue nation known as the "Alliance of Free Kingdoms". This so-called "freedom" evidently comes at a heavy price, as only a handful of their worlds have been raised to post-industrial status. But these primitives used their meager fleets to capture undefended Imperial production worlds, creating chaos as our trade networks, while being very efficient, are also extremely delicate, and shortages of resources plunged half the Imperium into open rebellion against the throne. While Terra dispatched its most loyal legates and provincial governors to restore order, I commanded the Praetorian Fleet itself to lay siege to the AoFK capital, easily sweeping aside their defenses. It is here that the Auroran Hegemony (a powerful neighbour who we respect for their similar appreciation for advanced technology, although some of their worlds are still at a very primitive antimatter tech level) is to be commended for graciously allowing us use of their jumpbeacons. As of right now, we have subjugated the AoFK's forces and have demanded their immediate surrender and vassalization. Failure to comply will result in the destruction of their capital and empire. The Imperial Senate patiently awaits their response, and remains willing to negotiate terms despite their savage and unprovoked invasion. A Praetorian Guard regiment has been left in orbit of their capital to ensure compliance with any terms negotiated. These were the all notable events that occurred during the past 7 cycles. There are many other smaller powers and one-world "empires" scattered around, as for these the Imperium does not recognise their sovereignty until their capitals have at least reached post-industrial level. Some have not even mastered the knowledge of physics necessary to obatain quantum technology, unbelievable! To think that mankind on Terra once employed ballistic weapons in warfare using crude kinetic projectiles known as "bullets"... how far we have come indeed. So ends the Imperial broadcast for Cycle 4631. Project Terminus: An extension for Anacreon 3. As even rustic nebula dwellers should be able to see, the Auroran Hegemony is indisputably the mightiest empire in the Galaxy. While the lesser powers scrabbled North of the Great Rift in the aftermath of the Bugz outbreak, the Hegemony has rebuilt it's industry in the South East and is stronger than ever before. Although jumpfleet numbers are down to a mere 3.3 million Undines, 1 million Eldritch and 2 million Warphants, this is still enough to outgun the next three largest powers combined. With more of the output from rebuilt and new Clusters coming online every Cycle, the Hegemony will once again have a jumpfleet to be feared. Despite the recent galactic turmoil, the Hegemony remains a beacon of calm and order, proceeding forward towards its goals as unstoppably as a Juggernaut, dominating almost 1000 worlds. Second among empires are the ancient Saxophon Traders Union. 305 cycles old and ruling 223 worlds in clusters and outposts spread across the Galaxy, they are a people of traveling traders, storytellers and warriors, when needs be. Although preferring to collect news of interesting events rather than take part in them, these well traveled nomads are not to be underestimated. While their industry may not be up to the standard of a truly civilised empire, they nevertheless posses a decentralised industrial base that allows them to field a fleet of .3 million Undines, 1.8 million Adamants, 2 million Eldritch, .6 million Stingers, and .8 million Reliant transports. As well as this jumpfleet the Saxophon Starship fleet is formidable, with .34 million Gorgos and 1.8 million Minotaurs guarding their holdings. With a considerable fleet built up over hundreds of Cycles and with both beacons and diplomatic connections across the galaxy these humble traders and storytellers are not to be underestimated. - The exact levels of strength among the remaining lessers is hard to quantify so we shall not assign precise ranks. All of these make their homes North of the Great Rift and are engaged in a constant state of tribal warfare. The Imperium is arguably the most organised of these, although currently it has fallen upon hard times after fending off attacks from every direction and winning all but one of it's recent wars. Although a civilised delineated cluster using people, they seem to have a cultural creation myth centered around the life of a warlord from the aftermath of Earth's first nuclear war. Which is strange, because as everyone knows Joshua Graham, the cruel technobarbarian tyrant who attempted to raise a city called Rome in the ruins of the Mojave wasteland, was struck down at the Second Battle of Hover Dam, leading to the New California Republic eventually reestablishing civilization across North America. As well as these strange beliefs, they also seem to think that their Imperial Capital is the literal Earth, the Manhome, Cradle of humanity. Hegemony historians and astronomers alike scoff at this, for as all enlightened people know the real Earth is located at the exact middle of the galaxy, at the very North Western tip of the Great South Eastern Clearspace Bubble. As can be seen on here just a few light years North East of the exact center of the Galaxy, lies Earth, currently an Auroran Gift World in service to the Alince of Free Kingdoms as a trade hub. Worst of all, their worship of technology leads them to raise CGA worlds to TL10, as if they don't know that a TL10 CGA world at 100% efficiency and all hab structures, spending 60% of its production on luxuries would produce 6632 a watch and consume 2747, leading to a net gain of 3885 but a similar world at TL8 would have a net gain of 4700! Despite these erratice beliefs and recent defeats, the Imperium is a tenacious and relentless foe, not to be underestimated. Third most powerful is the Gospel of a New Century. Although they rule 304 worlds, these fanatics worship an ancient cult known as Communism. This, and their relative inexperience on the galactic stage, explains the dismal production levels for an empire of their size, being able to field a fleet of only .2 million Undines, .2 million Adamants, .34 Eldritch and .32 Warphants. In 4361, though weak industrially and faltering in the first few conflicts it took part in, the GNC in alliance with Pandastan managed to defeat the Imperium and force unfavourable peace terms upon them, further reducing the Imperium's power. With further industrial reforms and continued strong alliances, the GNC has the potential to be an ascending power in the cycles to come. Allied to the CNC is the enigmatic Pandastan. Believed to be the decedents of genetically engineered slave Pandas from the planet Mintopia who overthrew their masters some time around the cycle 4300, their empire is able to field a fleet of .3 million Undines, .5 million Eldritch and .3 million Warphants despite taking a battering in recent conflicts. Known for being manipulative deceivers, they lured the naive Alince of Free Kingdoms into a proxy war with the Imperium, before drawing the CNC into the fight on another trumped up casus belli. Finally out of the notable lesser powers is the Alince of Free Kingdoms. Though caught up in recent wars, deceived by Pandastan and with its fleet wiped out by an angered Imperium, the AoFK is secure within the heart of the Great Rift. Though weak industrially and in war, this feudal federation has successful diplomatic ties with a number of other empires, including the Auroran Hegemony. Somewhat wiser after the Panadastanian Deception of 4361, they are focusing on colonising the Great Rift and rebuilding their fleets. - Every other empire is either a pathetic rotting husk like Q or so unworthy as to be unmentionable. Be glad that you have been uplifted by the great wisdom of the Auroran Hegemony, hope fervently that you may one day know the light of the One Truth. Here end the words of the Hegemony, return to your assigned work tasks or be flayed. As of Cycle 4364 Hegemony is stronger than ever before, it's old clusters restored to their pre Bugz Outbreak condition and new ones established. Soon all of the bubble of clearspace in the South East, once named all manner of things in times past by weak and forgotten empires, shall be known forever more as the Auroran Quadrant. To this end, a work of many cycles has nearly been completed. A great line of clusters 4,000 light years long has been created, fronted by a gate cluster just off Aurora Cluster itself. When the next round of industrial reforms have been completed, all these clusters will be fully dedicated to starship production and have their beacons set to backup and heavily guarded, save for the Gate Cluster, which shall act as the hub of the AHGHN. This accomplished, the entire South East Clearspace Bubble, the Auroran Quadrant, will be turned into a fortress the likes of which the Galaxy has never seen! When this plan was conceived many cycles ago, before Q had even been revealed to be a paper tiger holding a glass cannon, it had been planned to name this interstellar curtain wall The Barricade, in honour of that unbreakable alliance of legend. Events have changed matters. It shall now be known as the Bugz Proof Fence. In other, less glorious and magnificent news, there has been much activity among the minor powers. Word of the ancient wisdom and galactic acumen of the Saxophon Traders Union has spread to many of the younger empires, leading to a flurry of embassies as the upstarts seek wisdom from their elders. This action is in accordance with the One Truth. North of the Great Rift, there has been a great flurry of building as the GNC and Imperium settle into what had looked to be a hard peace for the followers of the Eagle. The GNC has completed economic reforms in its Eastern Core while expanding its presence in the West, guaranteeing the independence of the mysterious, newly emerged Energia. With recent industrial improvements the GNC fleet has risen to 0.5 million Undines, 0.5 million Eldritch and 0.6 million Minotaurs guarding the clearspace bubble that forms the GNC Core. Despite GNC dominance in the North, the Imperium has completed an enormous expansion while sticking to the letter of its peace treaty with the GNC, forming a full five clusters in only 2 cycles, an impressive feat even by the standards of the Hegemony. Whether the Imperium will survive to turn these territorial gains into ships and soldiers or be struck down dishonourably by the GNC before they can regain their strength remains to be seen. Three new powers have emerged on different sides of the Galaxy. The Energia, already mentioned as allied or possibly vassalised by the GNC, is a mysterious people making their home in the Utter North West. Believed to be either a strange, quasi-plasma based glowing crystalline race or the decedents of a Atomic era slaver faction who took control of all power production worldwide, little is know about this mysterious empire, save that it has rapidly transitioned into a semi-orderly cluster network. In the Utter East, a small empire known as Windsor seems to be using an affiliation to one of the ancient royal lines of Britannia, a fictional island nation that features heavily in Old Earth folklore, to justify what is increasingly looking like an internal rebellion against the somewhat decrepit Pandastan. Finally, in the Utter South lies the empire of the People's Stellar Republic. Much like the GNC, they are another barbaric people worshiping an ancient faith that mandates potatoes, crude spirits distilled from rotten potatoes, rugged automatic rifles simple enough for a TL2 blacksmith to create and miseryy. It is unclear if this young empire is a direct branch of the GNC, the result of a long lost GNC colony expedition or just another culture that likes a red colour scheme and Tesla coils. Here end the words of the Auroran Hegemony, return to your assigned work tasks or be cast into the Pit of Despair. We have already acknowledged the superiority and dominance of GCN military power in the far north, and we do not seek to challenge them. We are, in fact, faithfully following not only the letter but also the spirit in which the surrender peace terms were agreed upon and thus duly enforced. Following the humiliating defeat of the Praetorian Guard in what was a pyrrhic victory for GCN's Fleet Kalinin at the Battle of Terra, the Senate advised the Imperator Aeternal to immediately sue for peace terms in the interests of self preservation. Harsh terms, but fair nonetheless considering past Imperial belligerence in the Northern sector. We unreservedly apologise for the destruction wrought by our legions in the past 7 cycles and accept full responsibility for all events leading up to this unfortunate defeat. As for our recent large-scale expansion, it should be emphasised that the terms called for cessation of territory, fleets, as well as acceptance of GCN projecting power into the Terran home sector via a forward operating base. What it did NOT call for was vassalship, indentured servitude or long-lasting penalties in favor of the GCN-Pandastan alliance. The Imperium is still a sovereign power in her own right, and shall remain so for a thousand years. And as a sovereign power, we have the right to settle colonies where we please over unclaimed regions. The Contingency Gates designation Thaumiel, Euclid and Keter were constructed as an emergency measure to restore Imperial fleet power in the interests of national security. As we know from firsthand experience, certain powers in the galaxy are more than happy to capitalise on the defeat of another sovereign to gain more territory for themselves. The new Imperial fleets are being constructed as a defensive measure first and foremost. Lastly, regarding the Aurorans' perception of our culture, it is with great amusement we do inform them that despite their advanced technology, their historical records are woefully inaccurate. It appears these so-called "records" about Terra's history have been derived from a popular 21st century computer game known as "Fallout". The Imperium at its greatest extent of 350 worlds in the Terran year 2018 AD (galactic cycle 4635) is what you see today. Much has changed in the Galaxy in the last six cycles. The Hegemony is of course stronger than ever, having completed the Bugz Proof Fence, the Outer AHGHN Gate Cluster and nearly finishing the total conquest of the South East. With a jumpfleet of 4.5 million Undines, 2 million Eldritch and 3.6 million Warphants and a starfleet of 1 million Gorgos, 0.5 million Megatheres and 1.5 million Minotaurs, the Hegemony has no equal in space. While the Hegemony has been busy implementing an industrial plan that covers a quarter of the Galaxy and ensuring its claims on the far flung AHGHN, many of the lesser powers have also been hard at work carrying out their own schemes. Among these, the Imperium has risen to from the ashes of defeat to stand foremost. Despite being forced into a harsh peace soon violated by the treacherous GNC/Pandastan Alliance, the Followers of the Eagle have once again snatched Victory from the jaws of Defeat, casting down their foes and seizing 516 worlds, almost a quarter of the galactic volume North of the Great Rift. With a strong industrial base thanks to their nature as a civilised cluster using people, the Imperium currently boasts a gunship fleet of 2.3 million Minotaurs and a jumpfleet of 1.1 million Eldritch and .45 million Warphants. With many victories against superior odds and despite some severely confused historical records about the first preindustrial, industrial, atomic, digital and space ages on ancient Earth and astronomical records concerning its location, the Imperium has proved itself to be an empire not to be trifled with. The ancient and venerable Saxophon Traders Union still stands strong at 313 cycles old. Despite attempts by some younger empires to encroach on its numerous outposts spread across the Galaxy, the Union continues despite all that the Galaxy throws at them. Although outgunned by the Hegemony and Imperium, the Union still possesses the third most powerful jumpfleet in the Galaxy, with 2.3 million Adamants, 2 million Eldritch and .9 million Reliant Transports. While preferring to observe and trade in information, this ancient people are not adverse to defending their territory and make better friends than foes. Below the Imperium and the Saxophon Traders Union stand a wide array of lesser powers whose strength varies from moderate to severely limited. By sheer fleet strength and industrial base alone the Gospel of a New Century is the greatest of these and the only one to possess a real fleet, but has been thrown into a state of stagnation due to a combination of its defeat by the Imperium and its barbarous ideology of Communism. With a modest jumpfleet of .9 million Undines, 1 million Eldritch and .45 million Warphants, the GNC could be a power in the North if only it could overcome its internal political strife. This total government shutdown is expected to last at least another 5 cycles. Whether the GNC can survive this difficult period remains to be seen. In the Utter North West, Engeria continues to expand. Although its forces are currently limited to .27 million Eldritch, this mysterious and fast growing empire currently rules 173 worlds and is on course to expand right up to the Imperium's Western borders. Although the current relations between the Imperium and Engeria are unknown, Hegemony analysts predict at least a 75% chance of some conflict in the next ten cycles. In the Utter East, the empire of Windsor has revealed itself to be an offshoot of the ancient Hexacarbide Brotherhood, declaring it's goal to be the acquisition of this abundant low tier resource. Although hampered by a low tech fleet of just .27 Adamants, this strange people are expanding into the void left by the Imperium's destruction of Pandastan, claiming 78 worlds in the North East. In the heart of the Great Rift the Alince of Free Kingdoms has expanded to 124 worlds and transitioned to a Law&Order doctrine, although it's production levels remain dismally low. Despite an almost non existent fleet, this weak empire remains on good terms with its neighbors, largely due to the fact that no one wants to live in the middle of the Great Rift. Despite their military weakness, the AoFK has strong cultural soft power, being the custodians of ancient Earth, cradle of humanity. Currently designated "Auroran Gift World Earth" in memory of the Hegemony's generous ceding of the world and designated a trade hub, the birthplace of Humanity is well worth a visit by any seasoned Galactic traveler. Of particular note are the many museums documenting memorable moments from humanity's early days, including the construction of the Pyramids, the Great War that ended the first Atomic Age and the rise of the New California Republic. The Earth tourism board is currently fast tracking visas for Imperium citizens who wish to take part in historical reenactments of the First and Second Battles for Hoover Dam. Following the collapse of the last remnant of Q, the South West has become a wide open wilderness ripe for colonisation. Aside from the Saxophon Traders Union, who have little interest in expansion, the empire best poised to take advantage of this opportunity is the upstart People's Stellar Republic, a group of dangerous barbarians following the same destructive creed as the GNC. Although crude, these are a cluster using people who's quick expansion to 29 worlds speaks of their potential. Whether the PSR will collapse like so many others or transition into a real galactic power is unknown at this time. Finally, the dregs of the Galaxy. Huddling in the Great Rift are the Soviet and Observer empires and the Sancthuary Union. Not even minor powers, these huddle in the badlands of the Rift, outcasts on the edge of civilisation. Here end the words of the Hegemony, return to your work assignments or be punished with fire. In the glorious 32nd year of the Imperium's foundation, it is with great pride that we announce our grand ascension from a lowly minor power to the second greatest contender on the galactic stage. We have brought the Pax Imperia; the Imperial Peace, to over 600 worlds and 4 trillion sentients who have been granted citizenship in our utopian society. With every passing year, these numbers grow as the Legionary Fleets designation "Sol Invictus", "Imperator Caesar" and "Potentia Maxima" continue their tireless effort to uplift the many fringe worlds still not incorporated into efficient trade clusters. Our economy has also been restructured to a more practical long-term solution, following the deliberate collapse of the emergency clusters constructed to fund the Great Northern War. We have relocated these industrial centers to more easily defensible locations around the central clearspace region which is surrounded on all sides by nebulae. This positioning allows for a strong starship and ramjet-based defense, while any would-be invaders will be forced to utilise comparatively weaker jumpships, if they can gain jump access at all. More importantly, a broad economic review of world efficiencies at various tech levels has been conducted. After much experimentation, the Senatorial Commission for Technological Development has determined there is indeed no benefit to raising CGA worlds to TL 9 or 10, as their increased consumption of luxuries outpaces their increased production levels, leading to a net loss of productivity. For a review of military affairs: the Grand Imperial Fleet has been reorganized into 6 divisions, each responsible for the defense of their individual sector. At the heart of the Imperium, the renewed Terran Praetorian Guard is the strongest of these; having been massively reinforced after the disastrous First and Second Battles of Terra. At present, the only power with a fleet large enough to threaten our sovereignty is the Auroran Hegemony. The most powerful empire in the galaxy: as they are so fond of reminding us "lesser powers". Fortunately, the Imperial Diplomatic Corps have negotiated a 30 year non-aggression pact, to be renewed as deemed necessary after this tentative period of co-existence. We have agreed to keep to our respective dominions in the north and south, barring the Hegemony's "highway network" of jumpbeacons constructed around the fringe cluster Byzantium. We would like to take this opportunity to remind them that the now-defunct Pandastan and its former ally GCN also regarded us as a "lesser power" rather than equals merely by virtue of difference in military strength... and the rest speaks for itself. With regard to the Saxophon Traders, relations have undoubtedly soured following the enforcement of the long-standing Imperial claim over what they called the "Londor District", a cluster of worlds to the north of Terra also in the same strategically advantageous nebula-locked region. These worlds will be appropriated into two new clusters designation "Nova Britannia" and "Dominus Astra", completing a circle around the central Terran cluster, forming a full 7 in total (not counting the far-flung Byzantium which mostly produces ramjets). As mentioned, this action has unfortunately all but destroyed diplomatic relations, with both powers banishing the others' emissaries from their capitals. Wisely however, the Saxophons have not chosen to engage in further conflict by attempting to reclaim those worlds. The Imperium will also not push South and has no claims beyond the Great Rift. As for the others, the AOFK have decided to honor the Imperial proposal of forming a mutually beneficial alliance. The Senate originally scoffed at allowing these "free kingdoms" to survive after their failed invasion of Terran space, but warmed to the idea that a small empire backed by Imperial interests can do... certain things that a larger one cannot. Specifically, these things include the destruction of other small empires the Imperium cannot touch due to the ever-present danger of open revolt in the provinces. As it stands, they are under the Legion's protection and any attack on them is considered an act of war. We have extended the same offer to Engeria and Windsor, both of which have unwisely declined in favor of retaining their own independent autonomy. As for the GCN, Imperial scouts have reported little to no activity within their borders. We have poached a handful of worlds on their fringes that lie within range of our clusters' trade hubs, but will be making no deliberate move to destroy their empire regardless of past conflicts. The nation of Pandastan cunningly orchestrated both attacks by AOFK and GCN, and following the appropriate dispensation of Imperial Justice on their capital the Great Northern War has been considered concluded. The addition of Panda captives to the gladiatorial games in New Rome will be an amusing spectacle. Location: Beneth some surface... OH! YES HEX! I declare the Windsor Project. I am issuing a decree for the industrialization of the near by galactic area in order to harness the power of hexacarbide in the Distant Colonization Protocol 1. Within Protocol 1 the acquisition of hexacarbide is Priority 1. The Protection of hexacarbide industrial complex is Priority 2. The destruction of the HIC will result in the loss of valuables. Windsor is a humble empire which seeks to extract the valuable hexacarbide and understand it's secrets. This is the Windsor Project Proclamation. After a recent successful prospective expedition, there are bountiful abundants of Hexacarbide in the Western Galactic Rim that would look most nicely as a Monument in Little Windsor Square, Central Distract of Little Windsor, just south of the Capital Complex. The location of the GHRJ is to be decided at a later date. The scientists of Windsor have labored long hours and produced good goods! We proclaim the Quantum Age for Windsor. The good men of Windsor have successfully manufactured Eldritch and Gorgos, a truly advanced civilization has graced the empire of Windsor. The Post Industrial Age could be a possible next step. The Megathere-class Starcruiser has been on the desk in the planning office for some cycles now. Manufacturing facilities are well founded and producing Adamant-class Jumpships, Minotaur-class Gunships, Relient-class Transports. Many of the brave and a few of the bored Windsor galactic citizens have joined Infantry units and the grand Imperial Guard. Combat seems distant, but there are many planets with Hexacarbide that need to be wrestled from the hands of the barbarous multitude. Population densities are rising, and Planetary Archologies progress readily, construction is on schedule. The Hexacarbide Miners Colony has been officially established and is well underway. Good luck to all future miners and their prospects. The construction of the New Hangzhou-HMC Direct is on track to be completed within the current session. Windsor analysts suggest Hexacarbide futures are skyrocketing. The development of the southeast and south western corridors of the Windsor empire are entering into their full implementation stage and over the next 5 sessions will undergo a clean sweep and complete colonization effort that will hopefully be fully supported by the galactic community. On the home front the base empire exceeds 15 production worlds and will approximately double in number by the end of 10 sessions. In the north quadrant the western sector has been under intense conflict with entrenched barbarian dogs with large guns. We built larger guns though, so we should be good. In the east, complete success in Hexacarbide acquisition has led to the amazing technological revolution of the Quantum Age. Hexacarbide is more rare a gem than first believed. Expansion has been necessary over the cycles, and has gone well. With the opening of the West for colonization, expansion of the HIC is growing at a good pace. Large deposits were found on multiple worlds. However, with the depletion of Bw Object, Metallic Bromide, Delta Carinae One, and others, we have needed to turn our concentrations on much more difficult sectors. Windsor exploratory teams have pushed into the regions once held by Pandastan, which are heavily fortified. Technological progress has been spurred by such offensive barbarians. Conquest is moving along at an acceptable pace though. The Western Colonies were quite fruitless at first, but it appears there are even larger reserves of Hexacarbide than our futurists predicted. It isn't that they died for their lack of accuracy, but they did lose half of their future reserves. A heavy hand is sometimes needed in days of discontentment. Fighting has been heavy along the frontiers. The old Pandastan worlds are not giving in to the way of Windsor easily. So we have been forced to create monuments from their bones and boots, paid for by their worn out backs. Worlds long believed to be loyal have undergone eruptions of rebel propaganda. I have been assured by local scientists they are only local rebellions and nothing to get too worked up over. While dissension is smashed one area, new worlds that need to be excavated are being discovered. Industry is is doing well overall, but supply issues within the cluster trade sector are causing deficiencies. Overall, world production is going well as efficiency increases daily. Hexacarbide Colony is fully established and the link with the main empire is currently under fortification restrictions. The civilians appear to agree. Exploration of Hexacarbide has resulted in vast reserves being discovered. We look forward to bringing order to the barbaric worlds with sophisticated miners equipment and resources necessary to extract as much Hexacarbide as possible. It is a good time to serve in the empire of Windsor. Rebellions sweep the through Windsor, vast fleets are lost to those who shall be known as the Independents. It is chaos. The 4370's shall be known as The Great Post-Industrial Revolution of Windsor, a dark time of chaos and civil war... Long Live the Empire! The H in H2O is Hexacarbide. The H in Hexacarbide is Hexacarbide. Heaven is made out of Hexacarbide!!! In Cycle 4379 the galaxy is experiencing a rare period of peace, a time of reason where mighty works of industry are accomplished, empires engage in acts of cooperative science and barbarians are uplifted by foundations instead of the cleansing fire of a polaron lance. Such times are rare and the Hegemony advises all powers to take mind of the old volcanic world adage "stockpile organic food while the fire-rain is in abatement". The Hegemony is of course stronger than ever. With the entire South East standing in the light of the One Truth, industry is being laid in place the likes of which the galaxy has never seen. Eight full clusters have been dedicated to starship production in the mighty bulwark that is the Bugz Proof Fence. Past this unassailable barrier lie another eight clusters producing jumpships. In the Utter East are worlds waiting to be formed into a handful of half clusters producing useful but not critical things like Armored Infantry and Helions. The Hegemony jumpfleet stands at 5.2 million Undines, 3.9 million Eldritch, 1 million Adamants and 4.5 million Warphants while the starfleet consists of 1 million Megatheres, 2 million Gorgos and 3.5 million Minotaurs. In this Age of Peace, the Hegemony has sought to complete its territorial claims and pursue its industrial plan, with the only other real events of note being the signing of a non-aggression treaty with the Imperium until Cycle 4400. Much like the Hegemony, the Imperium is also stronger than ever, holding sway over the North with a Hexacarbide fist. Although an eccentric people, there is no doubt that they stand in the light of the One Truth. 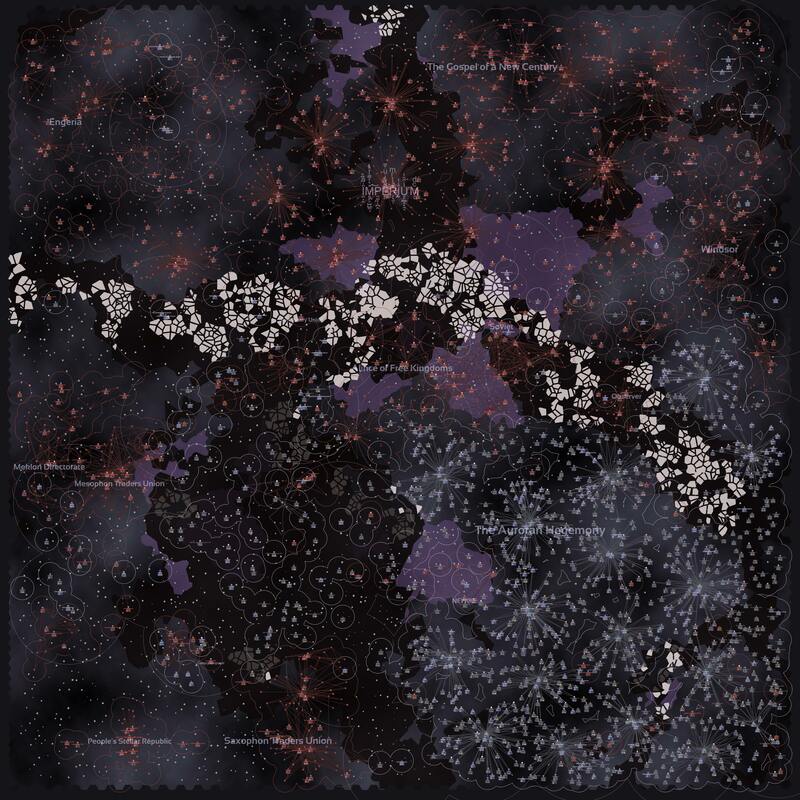 Having concluded all their outstanding wars in the North, including a conflict with the sadly diminished Saxophon Traders Union that the STU didn't even know it had, the Imperium have completed one of their main cultural goals and forged a ring of six clusters around their main imperial TERRA cluster. With a further two clusters in the North East and one in the North West the Imperium is fast becoming an industrial powerhouse and at 686 worlds stands as the only true rival to the Hegemony. Its fleet consists of 1.3 million Undines, 3.7 million Eldritch, 4.1 million Minotaurs, .8 million Cerberus and a mere .6 million Warphants. With a heavy focus on gunship offenses that bypass beacons, even going so far as to field the rarely seen Cerberus for nebula duty, and a long history of victories this is not an empire to be taken lightly. The Saxophon Traders Union still stands as the galaxy's oldest living empire, having survived for 322 cycles. Although their most Northerly cluster was annexed by the Imperium they still have the third largest fleet in the galaxy with 1.2 million Minoraurs, 1.4 million Adamants, 2.2 million Eldritch and .7 million Reliants. With outposts in three of four galactic quadrants, including the otherwise forbidden South East, the STU still aren't dead. Out of the three empires that follow the ancient cult of Communism, only Soviet is an active force in the galaxy, with both the Gospel of a New Century and the People's Stellar Republic stagnant. Soviet, the least well placed of the three and until recently the weakest, has begun efforts to escape the dismal clutches of the Great Rift. Although small, it has built a crude Mesh Trade Net and is trying to expand into the clearspace to the North and South. Little is known about these enigmatic nebular cultists, save that they presumably like Tesla coils, alcohol distilled from rotten potatoes and crude projectile weapons simple enough for an illiterate blacksmith to forge. The Alince of Free Kingdoms has expanded and built some light industry but still remains a very modest power. In the Utter North West, the mysterious Engeria are stagnant, having not expanded for over ten cycles. Whether this will continue or if they will burst back into their rapid expansion remains unknown. Who knows how this unknowable empire thinks. In the Utter West, the barbaric Meklon Directorate has erected a Mesh Trade Net and its scouts have been seen across the galaxy. Little is known of these barbarians but Hegemony sociologists speculate that the original colony ship from ancient Earth that founded their culture must have purged all entertainment save for an ancient game known as Master of Orion. It is theorized that, with nothing else to base a value system on , they chose to emulate the culture of the Objectively Best Race. One of the most unlikely empires to succeed in the Age of Peace has been Windsor. Although beset by rebellions and economic chaos, this small empire has begun to take a place on the galactic stage, launching its first exogalactic colony mission to the South West, establishing its first attempt at a cluster and putting out a crude propaganda bulletin. If these lively barbarians can continue to learn the secrets of civilisation they may have a place among the great powers one day, if they can survive. Here end the words of the Hegemony, return to your work assignments or be immersed in acid. Successful establishment of 2 prospecting colonies, so far, nothing has been found. Very.... disappointing. Perhaps a production of Hexacarbide can be attempted. Windsor has fallen upon difficult times, but the West has yet to be fully excavated. There are many reserves that have not been touched, but soon will be dispatched. A further 3 colonies are in the planning process. Next Session will be implementation of the 3rd prospecting group.Groups 4 and 5 have yet to decide a location for mining, most likely along the galactic fringes. As the civil war draws to a close a shinier empire is rising from the crucible. There is much restructuring that must be done. Old trade routes must be established and re-organized. It is an economic nightmare. The Post-Industrial Revolution has made the cluster sectors absolutely useless. It is a wonder that the entire sectors were not lost and are still intact. Within the next 3 cycles, production should resume at a normal pace. Within 5 cycles there should be an increase in production. 7 of the starship manufacturing facilities have crashed, but 2 still remain at full force, maintenance of fleets seems likely until the conclusion of the 5th cycle. Tic Toc... The mouse ran round the clock.... and got ate by all of the bugs. Rays of cosmic waves crashing through still dead night. Tic Toc... The mouse ran round the clock.... and got ate by all of the BABY KITTENS . The great Windsor Civil War is over. The last of the rebels have been vanquished and peace reigns supreme within the empire. There have even been first successful peace negotiations between Windsor and Meklon Directorate. Progress has slowed within the empire, but sessions remain "ON SCHEDULE". With the collapse of the People's Stellar Republic, L.W., Winsor has saw it within The Great Plan, to oversee the prospecting and development of the galactic SW. The 4380's will be known as a decade of growth and prosperity. The civil war has had far reaching effects into the galactic economy and has led to the near complete collapse of the South Windsor cluster. Within the main empire many trade routes are in shambles and much restoration must proceed. Proceed it will! A booming economy for Windsor, the 4380's will be known as a decade of economic recovery and all the tables will overflow. From hence forth our currency is the Hexichrome and with it we will purchase paradise. A wave of recent rebellions has left the empire at an all time low production. In an effort to stem the tide of dissent we have are temporarily abandoning the Post-Industrial technology. In our assumptions, I have miscalculated. Disbanding the program has inadvertently caused our empire to begin a spiral downward to the Biotech. I will collect my thoughts and rebuild from there. It is probable that an empire wide restructuring is in order. To do away with clusters and regress to the barbaric mesh-net is not desirable, but one does what one must to survive in troubled times. Perhaps one day I can learn the ways of greater powers. Expansion is not a priority for the empire, but to ensure the security of the HIC there is a call to action that must be heard. The fleets of the galaxy are on the move. Peace has begun to waver. With cycle 4400 approaching no more or less rapidly, the empires are beginning to show signs of unease. A failed attempt to gain the trust of both Imerpium and Hegemony has left Windsor in the exact same position it was in prior, but with a bit of knowledge. Hegemony is not entirely confident he can defend himself from Imerpium, and Imperium is dead set on war. The other empires are relatively quiet. Gospel of a New Century and Engeria are no longer viable empires, hollow shells to divvy up among ourselves. Tensions grow between recently founded Meklon and old/new comer Alince of Free Kingdoms. As a try at diplomatic underhandedness, Little Windsor scientists suggested to try to be friends with one and attack the other, I have decided it is not necessary and could be potentially problematic. Fleets are on the move across the galaxy. Imperium has advanced into the galactic center. 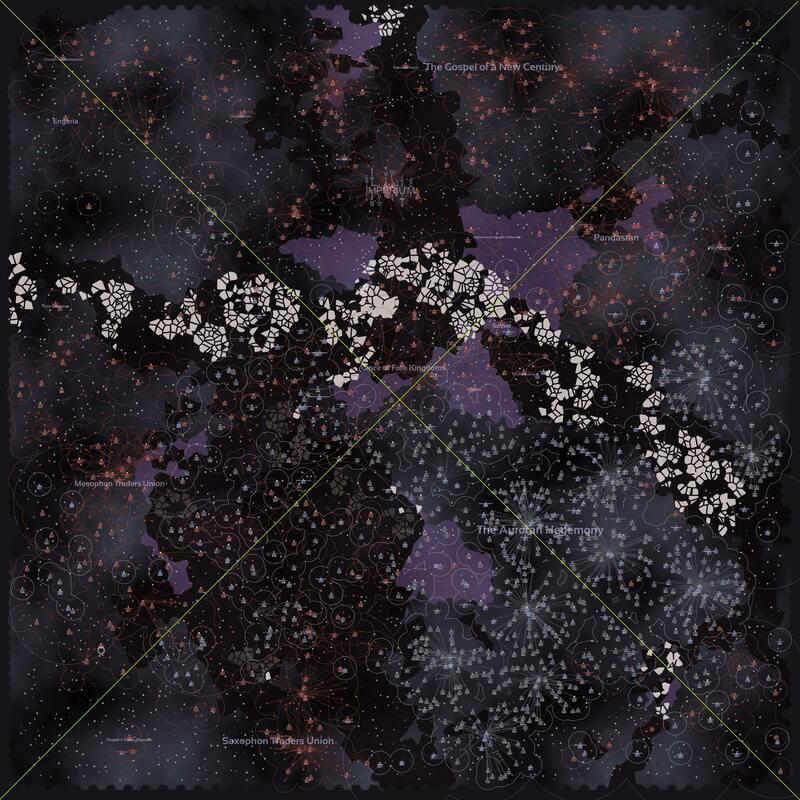 Hegemony has established more Sector Capitals as well as sent fleets toward the North, intent unknown. Imeprium has sent fleets to shore up defenses closer to home. Meklon is vying for time in order to grow his industrial base and compete with Alince. Alince appears to be satisfied with a measly little fleet that can only defeat Meklon, while boasting of the protection from Imperium, whom she attacked, whom will likely take her empire once Hegemony is out of the way. The two far north empire are dead and waiting to be dissected by more powerful emperors. Saxophone Traders Union is... an enigma to the citizens of Windsor, but appear peaceful. Old, wise, and respected, none dare challenge this ancient empire. The Windsor empire is a personal experiment. Questions to posit: How does the game strategy influence Anacreon? How does imagination function within a closed environment to allow a victor where communication is free and open? In what was does the empire reflect the person? How does inexperience or experience in various fields show up as strengths or weaknesses in game? Let it be known that the galactic menace known as the Imperium, who is a cancer on the northern reaches of the Galaxy, will never truly support any that it claims are its allies, and will attempt to deceive and trick them in to weakening themselves and allowing them to be consumed in its endless hunger; truly a threat to the continued existence to sentience that only is lesser to the Bug King himself. Queen Ilkay, of the AoFK has in her beneficence has decide to share the missive that the AoFK has received from the malignant hive of villainy. Diplomacy is the art of saying 'Nice doggie' until you can find a rock. The Saxophons were anciently created by the Mesophons scientists. We are the result of a genetic experiment. Our ancestors were trained to work as servants in the Mesophons palaces, with few intelligence but great abilities in music and entertaining. In many centuries our race evolved and we gained intellect, wisdom and rights. The role of servants passed soon to the robots and we became Mesophon Citizens. Mesophons are wise and kind people. We are now commercial partners. We still have also a strong cultural bond with our ancient creators. As all can see The Mesophon Capital is symbolically in the center of our second cluster. We have sworn to defend the Mesophons' Capital. We boggle if we think that someone can be so perfidious to use our devotion to our creators as an arm against us! We have to thank Queen Ilkay for her foresight, what a blessing for the galaxy to have her illustrios queenly presence! She may not have the greater empire of the galaxy but her wisdom shines more than all the lights of the corrupted Imperium Capital. We hope The Bugzzzz will soon come back in the galaxy to bring destruction upon the sovereigns with no honor. This Imperium utterly renounces any and all treaties, pacts, alliances, guarantees of independence and offers of protection extended to the rogue nation Alliance of Free Kingdoms. We have shown mercy to these miscreants in the past, after they initiated conflict by invading our worlds. Instead of demanding vassalization and submission to Imperial rule following their inevitable defeat, we have generously extended a hand of reconciliation, even offered fleets and worlds in exchange for services rendered. All this simply by virtue of being new in the galaxy. And do they respond to this benevolence with gratitude? No. They bite the hand that feeds them by not only deliberately delaying carrying out their orders, but leaking vital information on matters relating to Imperial security. This ends today. As I issue this missive, a Vassalization Fleet of 500k Undines, 500k Eldritch and 100k Warphants with accompanying legions has been dispatched from Terra. Its orders are to capture AOFK capitals, beacons and worlds until they are demoralized enough to submit as a vassal by appending "Imperial Province" to their capital name. Let them be an example to all others who stand in defiance of the Imperial throne.